After experiencing some of the coldest weather of the year, it’s hard not to get discouraged when trying to catch some fish. But, you’re in luck. 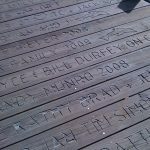 Wintertime fishing around Anna Maria Island can be quite productive if you practice some tried and true methods. First, you’ll want to target species of fish that can tolerate cooler water temps. Sheepshead are a good bet. In fact, they thrive in the cooler water and will take a shrimp when it’s offered. Black drum and redfish also are a good bet in cool conditions. Next, you need to give some thought on where to fish. For the sheepshead, reefs, wrecks, piers and docks are the preferred habitat. For the black drum and reds, try fishing docks in areas that are sheltered, such as residential canals. In these areas, the water is slightly warmed by the seawalls, which can make a big difference in the bite. Fishing offshore is a good bet as long as the seas are calm. 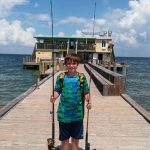 Fishing deeper water when the temperatures are most consistent can be quite good for a variety of species — including hogfish, Key West grunts, flounder and even a few snapper. Lastly, bait choice can play a major role in the overall success for cold weather anglers. Live shrimp are a great bait for wintertime fishing. If you’re into artificials, I suggest using soft plastics combined with a jig head. However, when using artificials like these, you want to slow down your retrieve, or the action of the jig. In cooler waters, the fish are less active because they are trying to conserve energy to keep warm. This being said, a fast erratic retrieve will most likely turn a fish off or even spook it. Slow your roll and you might have better success. Capt. Rick Gross of Fishy Business is targeting sheepshead around the artificial reefs in both Tampa Bay and the Gulf of Mexico. A small piece of shrimp combined with a 1/2-ounce knocker rig is attracting sheepies up to 5-pounds, although most average 2-3 pounds. Casting shrimp under residential docks and canals is yielding success for the anglers on the Fishy Business. In these areas, redfish and black drum are cooperating. Capt. Jason Stock is working offshore when the weather permits. While offshore, wreck fishing with surface poppers is still driving large amberjack to the surface in some explosive strikes. AJs up to 74 pounds are hooking up in this fashion for Stock’s clients. Fishing ledges while offshore is resulting in hogfish and lane snapper. And Stock reports there plenty of ripletail being found offshore around floating debris. Capt. Warren Girle is fishing inshore, waiting out the rough waters in the Gulf of Mexico. 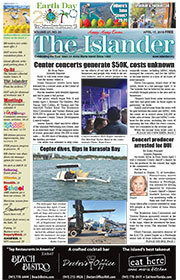 Fishing residential docks and canals throughout Sarasota Bay is putting fish in the cooler for Girle’s anglers. Using live shrimp as bait is attracting the attention of keeper-size sheepshead, black drum and redfish. Also in the canals are random jack crevalle and bluefish, which adds a nice mix to the bite. Capt. Aaron Lowman is running charters to nearshore and offshore ledges when the seas are calm. 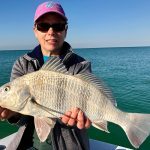 By using live shrimp on a knocker rig in these areas, Lowman is finding a variety of species, including hogfish snapper, porgies and flounder. On the windier days when the Gulf of Mexico is too rough to navigate, Lowman is working around the Intracoastal Waterway and its adjoining bays. In these areas, dock fishing is proving prosperous for clients, who are reeling in catches of sheepshead, black drum and redfish. Jim Malfese at the Rod & Reel Pier says despite the cold temperatures, pier fishing is producing action. Pier fishers using live shrimp as bait are catching black drum and sheepshead with some frequency. Redfish are in the mix for anglers with a little luck on their side. To target any of these species, it’s always good to use a weighted rig so the shrimp sits on the bottom, allowing the fish to easily swim over and eat it. Capt. 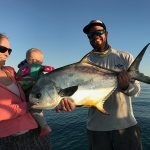 David White of Anna Maria Charters is targeting pompano along the edges of any of the grass flats where the shallow water dumps into a channel. He’s also finding fish along the beaches. To catch this much sought-after dinner fare, White is using Doc’s Goofy jigs or a reasonable facsimile. To sweeten the deal, a small piece of shrimp is added to the jig. This adds scent, which often results in more bites. Sheepshead are being found by White, especially around docks and bridges, where his clients are taking home a fish fry. Live shrimp on a bottom rig is producing the bite.